Home theatre is a room designed in a living room or separately some allot room for it. This room generally includes a LED or LCD mounted on the wall and a video projector is attached to the roof. It consists of couches, chaise, chairs and a centre table for serving snacks or casual drinks. The walls of the interior are made with sound proof materials so that it does not create any disturbance to the neighbors. 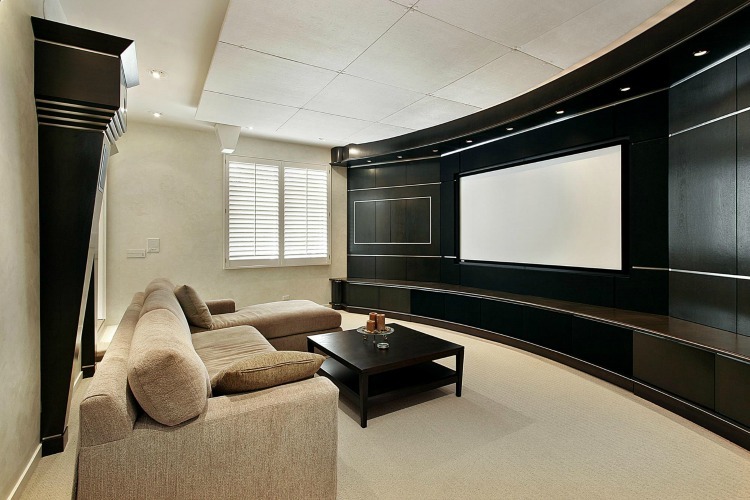 Here are few images of modern home theatre designs which will be helpful for you. The modern designs gives a fab look and the interior is decorated with stylish furniture. In the view of image you can see a modern home theater interior which is elegant. The false ceiling is a pop ceiling suspended under structured ceiling with hidden lights and the room is decorated with american elm draperies. The flooring is laid with a rug and has a multi colored carpet laid on it. You can prefer this design if you have a large space for designing home theater room. In this room many can get seated because many couches with pillows are arranged and has timber table for serving. The interior has LED sconces mounted on the wall and has a big screen television mounted on the wall for entertainment. This image views a modern home theater design and the false ceiling is a dry wall ceiling with recessed lights. The flooring is made of laminated hardwood and smooth carpets. The interior has wooden wall cladding and the room has large space and many people can be seated. There are colorful sofas with cushions. The screen is mounted on the wall cladding and a video projector is attached to the roof which projects the image on the screen. The screen is covered with tab top draperies. This image views a beautiful and simple modern home theater ideas. The false ceiling is a dry wall ceiling with plain light fixtures and the interior is decorated with monochromatic beige color. The flooring is made of ceramic white tiles and the interior has plenty of timber closets which are decorated with display items. The room has day bed, couches which are comfy for seating and the interior has wooden wall cladding on which LCD is mounted on wall and has timber paneling to store speakers and accessories.The wall cladding is made of wodewa real wood. The false ceiling is dry wall ceiling with simple light fixtures and the entire interior is decorated with light grey color. The flooring is laid with Lewis Flokati carpet which gives comfort while walking and the room has many sofas with pillows. There is a photo frame mounted on the wall and has a table with flower pot on it. As the screen of the LED is large and has more space in the room there are many sofas which are placed as rows and increased the height of flooring. The interior is also covered with tab top grey valances. The false ceiling is dry wall ceiling with plain lights and the flooring is made of laminated hard wood which has a beige plush carpet on it. This is a simple and modern home theater room and if you have small space you can prefer these designs for your interior. The room has sectional sofa with cushions. The interior is decorated with ceramic tile cladding on which LED is mounted and has textured tile panelling with closets. The closet is decorated with pea gravel stones. The purple ottoman at the midst of the room and is made of leather. The false ceiling is dry wall ceiling with simple light fixtures and the flooring is made of laminated hardwood on which a smooth plush carpet is laid. The interior is decorated with the tile cladding which creates a cozy feel in the room. The room has mid century sectional sofa with colorful pillows and cylinder cushions. There are chairs with wooden legs with a table which is used for serving or consuming edibles. There is a LCD which is mounted on the wall for entertainment. 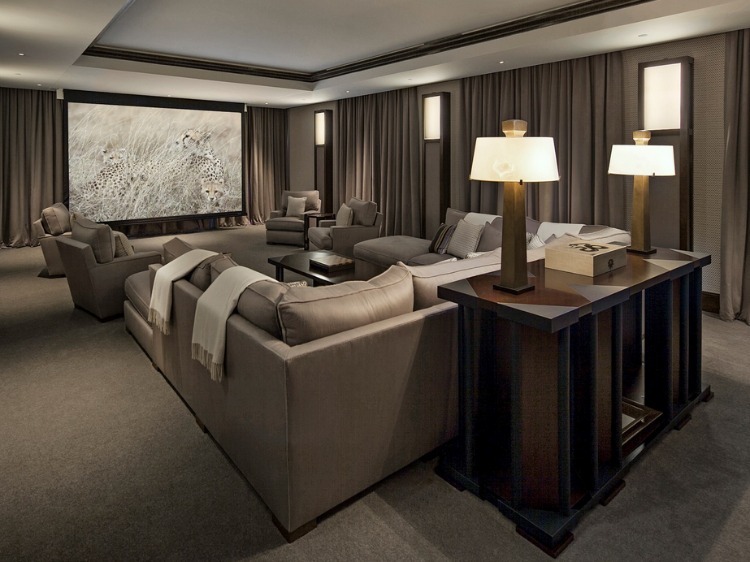 This image views a outstanding modern home theater room and the interior is decorated with beige in contrast with dark brown color. The false ceiling is a drop out ceiling with hidden lights and plain light fixtures. The room has a fire place which keeps the room warm and has sectional leather sofa with comfy cushions. The room has a centre coffee table which is decorated with edibles and candles. The flooring is made of ceramic tiles and has brick wall cladding on which LED television is attached. The room has a mini bar for consuming drinks and has chairs for seating. There is an extra large mirror which reflects the beauty of the room. In the view of the image you can see an attractive interior of modern home theatre. The entire room is decorated with grey color and is covered with tab top draperies. There is a wooden table which can be used for storing accessories or for serving. There are lawson couches with cushions and has a timber coffee table. The false ceiling is drop out ceiling with plain light fixtures and the room has carpet flooring. The interior has a big screen television which is mounted on the wall. In the view of the image you can see the interior has recessed lights on the pop ceiling along with hidden lights. The flooring is made with plain vinyl flooring which has a carpet on it and the room has large space where we can see dining space as well as kitchen is adjacent to the living room. 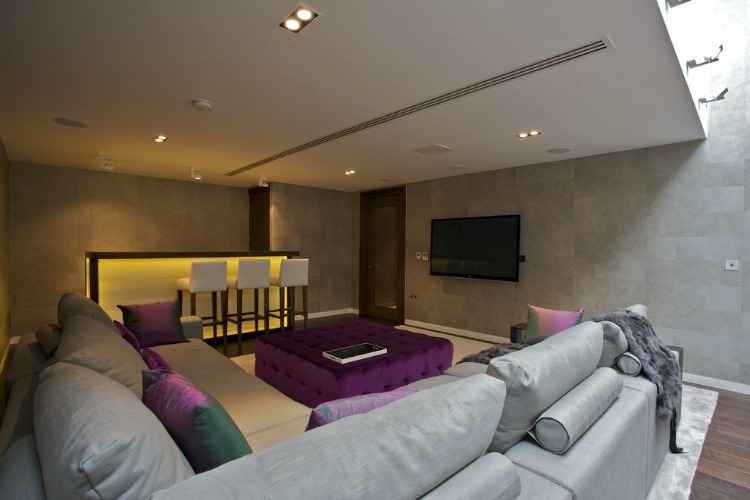 The interior has white panelling with a glossy look and has cabinets for storing adornments. The room has mid century white sofas with bright colored pillows and has a leather table for serving. The room also has tangerine chaise for getting relaxed or can even have a nap. 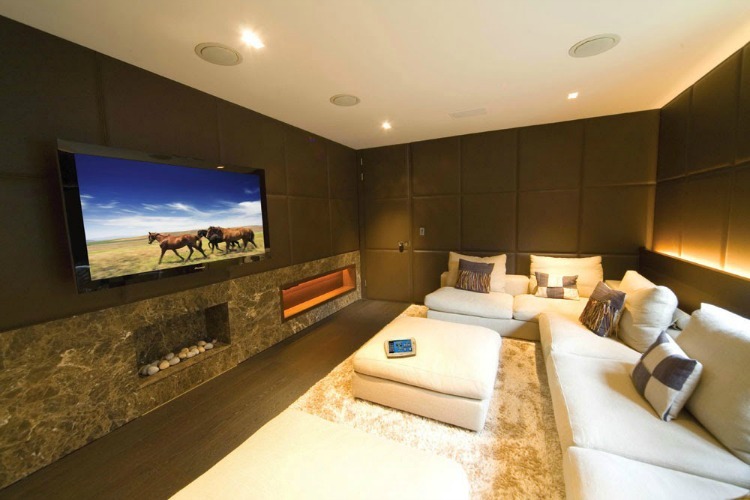 This image is a modern home theatre room with a grid ceiling and has simple light fixtures. The flooring is covered with carpet and has white blends. The room has wooden panelling with lights and cabinets for storing accessories. The wooden cladding is designed in a curved shape. If you have allotted small space for the interior of home theater you can prefer these modern home theater ideas. There are couches with cushions for seating and has a wooden leg coffee table decorated with candles. You can decorate the room with display items for creating a dramatic effect.